If you were lucky enough to actually land a pass to Lollapalooza in Chicago this year, or you’re planning your strategy for how to make Lolla 2016 happen, we have some very good news. 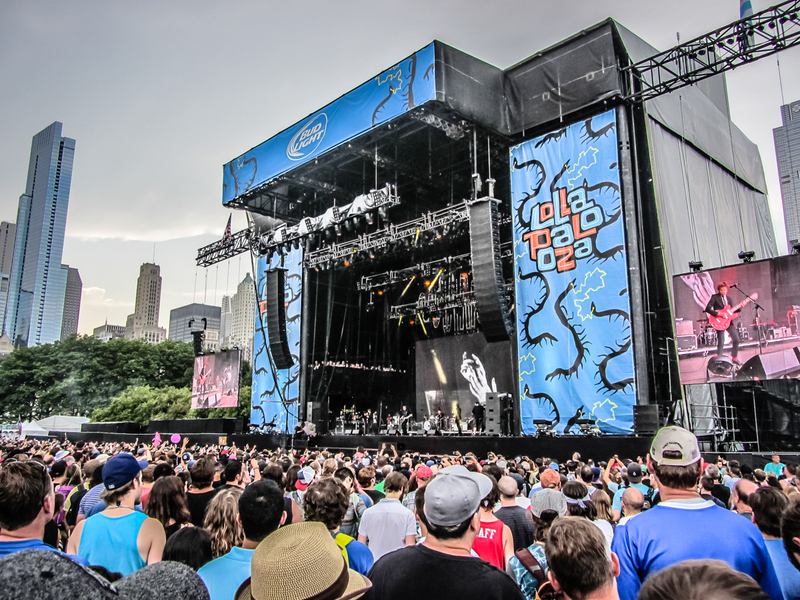 The best and possibly the easiest way to do Lolla…is by RV! 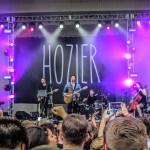 While we wouldn’t consider ourselves festival experts, we’ve been to our fair share (Coachella, Sasquatch, Outside Lands, Seagrass, SXSW, Jazz Fest, Burning Man) and with each experience, we learn a few new tricks. 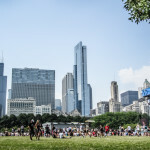 So, consider this your unofficial (because I’m sure we will miss something) Lolla by RV survival guide. Pretty awesome RV spot right! A big shout out to Jason’s mom Mary for buying our Lolla tickets as our Christmas gift and joining us for the party (sorry about the leaky air bed, we’ve fixed that)…you are the coolest mom in-law ever! McCormick Place – These 24/7 staffed parking lots are a bargain at around $30 a night and the best part is the spots are reservable. This is the only RV overnight parking option we found (and we had to do a lot of digging to find it). 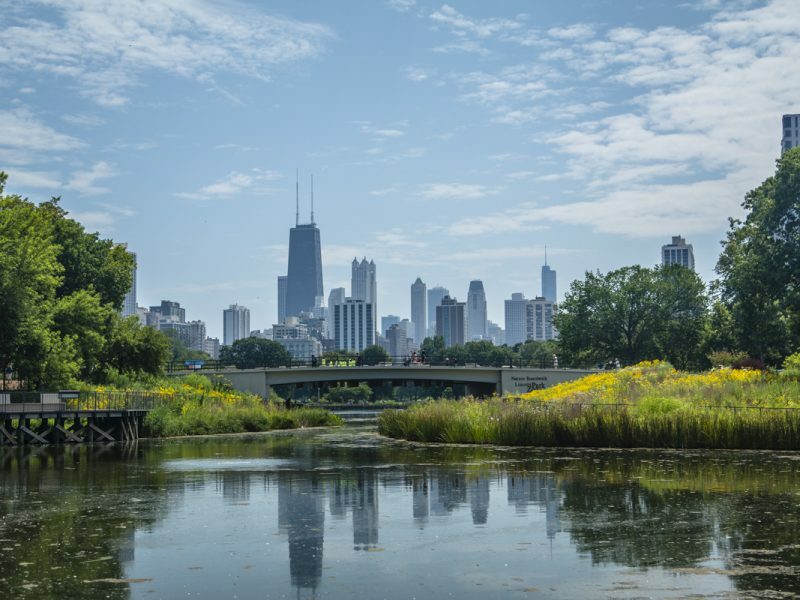 It’s a prime location that is close to the 18th street Metra train station that will drop you off right in front of Grant Park. Stay tuned for our video/post next week with all the details on parking here. For any newbie RV’ers, make sure you come prepared for dry camping because there are no hookups (water / electric / dump station). You will want to make sure you have full tanks of fresh water, propane and fuel for your generator (if you need it). We have a full solar set up so we don’t have to run our generator, we installed a composting toilet so we don’t have to worry about dumping our tanks and we have an array of other helpful dry camping gear. Backpack – if you’re like us and want to have a few creature comforts and be prepared for anything, you’re going to need a mini arsenal, which you should store in a small backpack. Comfortable shoes – It’s about a mile walk from one mainstage to the other, so chances are you are going to log a lot of miles in those shoes. Raincoat – Rain is common this time of year in Chicago and we had our fair share of it. We choose to embrace the water and go with the wet look. If you want to avoid that, pack a raincoat. They’re a lot better than an umbrella because they’re light, pack small, keep you dry and don’t block anyone else’s view (don’t be that person). Watch – With phones being the keepers of almost everything, including time, watches aren’t as popular as they once were. However, it’s nice to glance at your wrist vs reaching into your pocket to keep track of time so you can make it to your next show. A cheap waterproof watch is always nice to have. 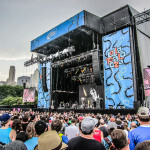 Apps – Lollapalloza has an official app and it is the easiest way to make a plan ahead of time. You can choose the artists you want to see and it creates a schedule for you each day. If you plan on exploring Chicago before or after the festival you may also want to have the Divvy (city bikes) and Uber (car service) downloaded as well. Of course, you may want to check out all of our fave road trip apps. Sunglasses – Because it’s my favorite functional accessory and you will want them, its sunny in Chicago when it’s not raining. Hat – It never ceases to amaze me how much more tolerable the heat is in a hat. Plus, hats are fun and a red sunburned face never makes for good photos.  Water – You can bring in two factory-sealed water bottles at a max size of one liter each and there are really nice refill stations. This will not only save you money but it also creates less waste. Insulated Reusable Mug – This one is a must for me. My iced latte stays iced, beer stays cold and I stay happy! Cash – Your wristband can be set up as your credit card and we say, set it up! It saves a lot of time and hassle. But just in case there is an issue, bring a small amount of cash as backup. Sunscreen – If you’re like us and show up early, you’re in for a long day of sun and to avoid a sunburn, you will need a morning and afternoon sunscreen application. Poncho or Wrap – it can get cool at night and the ground gets grubby quick. I like to have something that can be used to sit on during the day and if the need arises, could be used to stay warm at night. Solio – because let’s face it, no one can seem to live without a cell phone these days. Rather than searching out a charging station or have to be tethered to an outlet, bring a Solio (or some sort of backup battery) and you’ll not only stay charged, you can top off your friends too. Earplugs – for the sensitive ear peeps or the crazies who like to be right next to the speakers. Band-Aids – blisters, random accident…you never know when you’ll need one of these guys. 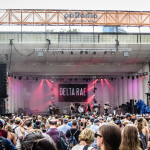 Transportation Discount – The Metra office underground near Grant Park offers a discounted “all you can ride during Lolla” pass. Basically you pay one discounted price and you can ride the train to and from Lolla each day of the festival. I randomly found this discounted pass when I noticed a poster in the pay booth, I’m not sure why but nobody seems to have information on this discounted train ticket pass, so make sure you ask at the window before you purchase any rail passes. Label Your Stuff – kindness does still exist in the world and if you lose your phone, camera, backpack or whatever…you’ll have much better chances of it returning to you if you have your name and info on it. 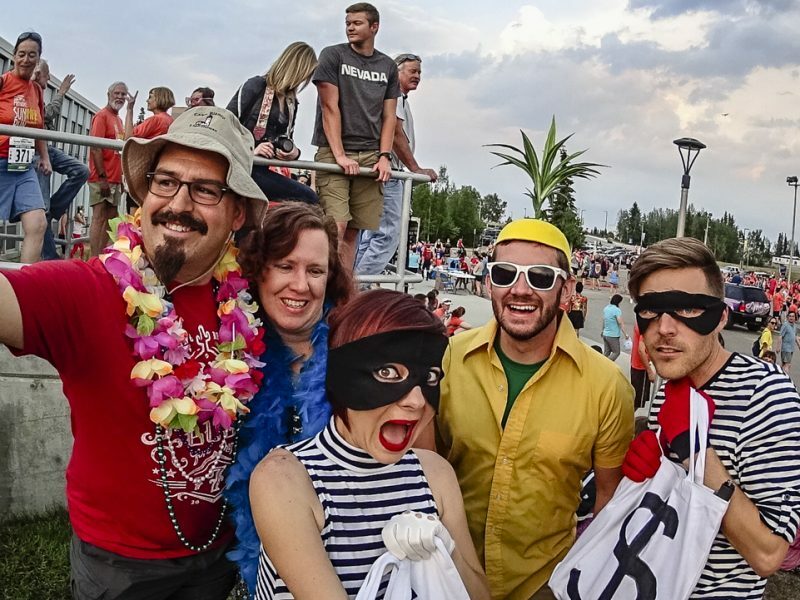 Eat The Food – Festivals are getting better at bringing in local food and Chow Town is just that. A great collection of street food style delicacies that you’ll actually want to eat, and there are tons of vegetarian options too!  Booze – If you want the cheapest buzz you can purchase an entire bottle of wine, but on warm days we prefer an ice cold beer. The craft beer tent didn’t offer any dark or high gravity brews, but beggars can’t be choosers, and the local brews from Goose Island were just fine. Overall we walked around 20 miles inside Grant Park over the three days of Lollapalooza, drank a dozen or so local craft beers and gorged ourselves on various types of street food. We loved every minute of it and while our feet needed a break, the rest of us could have kept going back for more. Its urban experiences like this that make us love RV’ing even more. We were able to live in the city for a whopping $30 a day and attend one of the nations best music festivals with all the comforts of home. 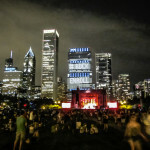 So yes, I do believe Lollapalooza by RV is the best way to do Lolla! 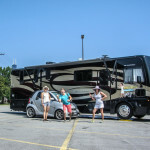 Do you have any Urban RV Festival tips or experiences to share? Do you know of another spot to park it in Chicago, we couldn’t find anything else!?! Tell it ALL in the comments below. This is so awesome. As a college kid, my friends and I almost gave up on going to Lolla after we saw the hotel prices. Not to mention, we would have never been able to navigate the internet to find this RV site. Now our plans are back on and we are so excited. Thank you so much!!! You wrote “Stay tuned for our video/post next week with all the details on parking here.” but I don’t see the next post. Did it happen? Quick question, how did you manage to park at the 18th Street lot as I enquired with McCormick Place and they will only allow overnight RV parking at the 31st Street lot which is further south and not as nice an area? Any advice gratefully received. Not sure why they are giving you trouble. It says on their site they allow parking at the 18th street lot. We just requested that lot specifically when we reserved and then alerted them again when we arrived. This is great! We RV parked just down the road (south) from you at the truck marshaling yard. I believe the price was the same? We rode bicycles right by your rig twice a day and were wondering about that lone RV in the lot! Very cool! 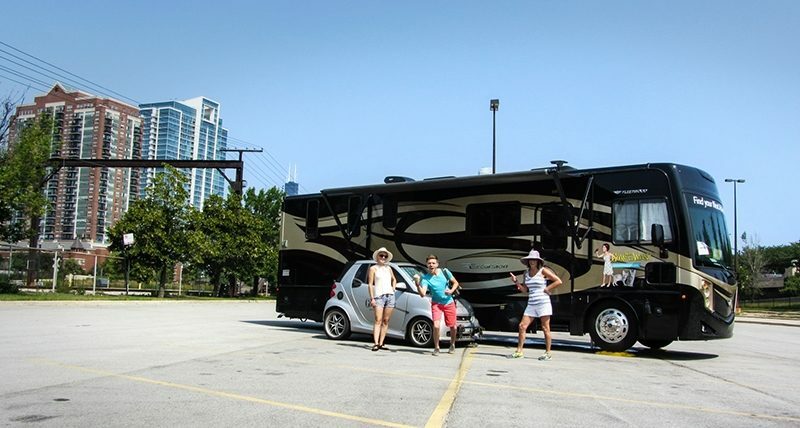 We live in Chicago and had no idea that you could stay in an RV during Lollapalooza. We see that you are in Fort Wayne now. 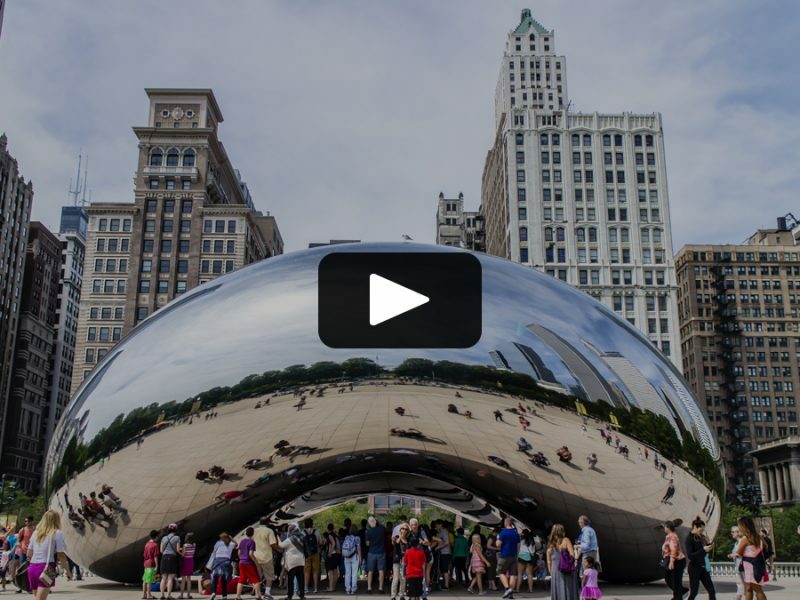 Will you be passing through Chicago any time soon? It is such a perk of full timing! You guys are in for an awesome year and your welcome for the reminder to get that air mattress patched up! Johnny’s Beef in Elmwood Park. Al’s Italian beef on Taylor street & The Italian ice joint across the street!!! I get the feeling you like beef? Ha ha, there is a lot of great food all through the city. We spent 12 days total in Chicago and loved every second of it! Lollapalooza video was choppy with absolutly no audio. Something wrong with my Puter, you tube, or harddrive? Hmmm, I haven’t had any other reports of issues. Maybe try again? I think you guys are great!! We started RVing a little less than a yr ago. You did inspired us to take the big step to this world of exploring, thank you! We have learned so much and a lot from your videos. Our RV named Freedom is only 22′ but it’s perfect for us. I can’t stop watching your videos you get better each time. I am a retired Sergeant Major U.S. Army and we have been married for 44 yrs we are old but feel like young specially when we are traveling in Freedom! Thanks for the love! I really wish we could squeeze into 22ft, that would be a dream! The smaller the rig, the more freedom and flexibility you have. Glad you are out exploring with us and hope we see you out there!